Best Casting Nets for 2019 & Tips on How to Use One Like a Pro! It doesn’t matter if you fish as a recreational activity or for commercial purposes, getting the right cast net will transform the entire experience. There’s no denying you can buy baits from a shop, but catching your own will save you money and its even fun, which is why you need your own cast net. Properly cared for, a casting net will last for many years and help you catch all the bait you need. But cast nets aren’t created equal, which is why we wrote this article. After hours of research, we identified and then reviewed the 4 best cast nets we would recommend for beginners and pros alike. We also provide tips for choosing a cast net including how to throw it from a kayak without falling over. So lets dig in. Basically, there are three types of cast nets from which to choose, minnow nets, bait nets and mullet nets. Minnow nets will come in handy if you’re targeting the small baits like minnows and shrimps. If you aim to catch the regular-sized baits such as the pinfish and the scaled sardines, then you’re better off with the bait nets. For mullets and other large baits measuring 12” +, you better invest in a mullet cast net. 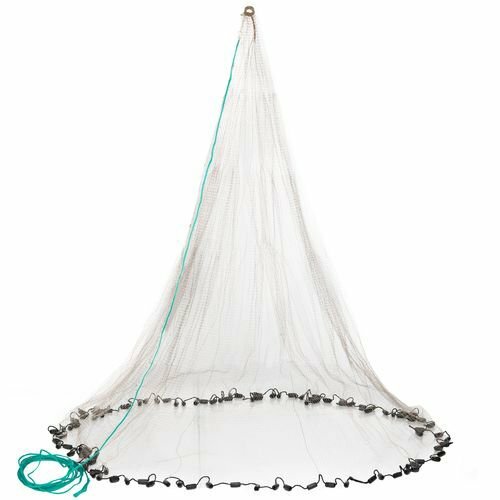 Recreational cast nets come in sizes ranging from 3ft to 10ft in radius. The commercial one can go up to 15ft. If thrown properly, a 5ft cast net will extend up to 10ft in diameter. And the larger the net, the easier it becomes to catch your bate with little effort. Kids will be comfortable using the starter 3-4 feet cast nets. For portability while embarking on a vacation, we suggest a 6ft net. Those with some level of experience will do best with the 8ft cast nets. Your targeted baitfish will determine the net’s mesh size. The rule of thumb is that the mesh ought to be small enough to avoid ‘gilling’ the fish trapped. For instance, consider using cast with a ¼ inch mesh for the 1-2ft baitfish. The mesh size increases with an increase in the size of your target bait. Usually, the lead line i.e. the rope around the perimeter of your net is normally classified by the weight per running foot. For the shallow water nets with small mesh, 1.25 pounds per foot is typical. The deep water nets will go up to 2 pounds for every foot. A net with more lead and tighter spaces will sink much faster and catch more fish with each throw. However, make sure the net isn't too heavy to throw. There are benefits to throwing a cast net from a kayak. A kayak is quieter meaning it’ll not spook your target bait. Using a kayak, you can easily access places that may be full of bait where a boat cannot navigate. Before you can start throwing a cast net from a kayak, make sure that the kayak is stable enough. You might consider installing outriggers to enhance the stability. Your body balance must also be good. For starters, get a 6-8ft cast net as a net size in that range will strike a balance between weight and how far it can span to catch bait from your kayak. One you have your load set up, loop the lead line through the fingers of your dominant hand. By doing that, you’re in a position to make a simple toss without lots of twisting or turning such that you remain in proper balance. We suggest that you load the net by looping the cast net-line and then holding it with the horn in your right or left hand, whichever is dominant. After that, reach down and loop approximately a third of the lead line in each of your fingers, starting with the index, middle, ring and the pinky. Then grab the rest of the lead line using your off-hand. Make sure you throw the strong side to the left side. If you're right-handed, throw the net to your left. Strive to keep your cast net clean. After use, get a five-gallon bucket full of water, add a fabric softener and dip your net. Not only will this practice make your nets healthier but also keep them softer. Constructed of monofilament, Betts Odd Salt Premium Cast Net would be your ideal net for catching mud minnows as wells as small pinfish. The net has a 6ft radius and spans 12ft in diameter when open and will catch plenty of bait. Plus, there’s also a similar style that’s 4ft in radius and spreads to 8ft when open. Both sizes have 3/8-inch mesh. Betts Odd Salt Premium Cast Net features lead weights weighted about 1-pound per foot. Not only will you find the net simple to throw but it also sinks quickly. 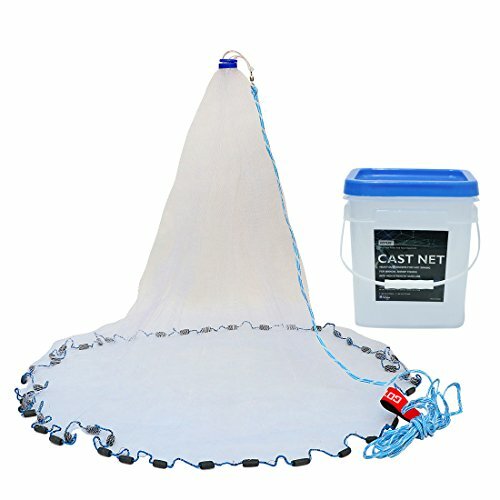 Even better, this cast net comes with a utility box that you can use for storing your fishing supplies including lures and hooks. If you’re a novice, we suggest the Goture American Saltwater Water Fishing Cast Net. Handmade using copolymer monofilament 3/8” mesh, this net will accommodate most of the bait species. With the material, the net feels softer, is easy to throw and lies flatter. The net has a 4ft radius and will spread up to 8ft. Its 3/8-inch mesh is 0.3mm thick, solid enough for daily use. What’s more, the cast net features a 32ft long floating poly handline reinforced with a premium grade 2” anodized swivel. The long handline makes it possible to cast the net far. The Goture American Saltwater Water Fishing Cast Net has its border taped with 3/4lb of weight per radius foot making it easier to throw and quick to sink. At the bottom is a tight seal that prevents your bait from escaping. With sizes ranging from 3ft-7ft, South Bend Mono Fil Cast Net is designed and tied by experienced net makers. It opens fast and sinks quickly. The next is made from monofilament and has a 3/8 inch mesh size capable of catching most bait types. Some cast nets have lead weight, which as you’ll gather, isn’t so environmentally friendly. South Bend Mono Fil Cast Net features steel weights that meet the standards. You’ll find pretty simple to throw. It sinks quickly, too. Attached to the net is a handy storage net. Use it to conveniently store your fishing supplies and tools. We have seen a couple of complaints though. They involve the storage box filling with water which later begins to smell over time. Looking to catch the small fish? Then we have an excellent solution for you. 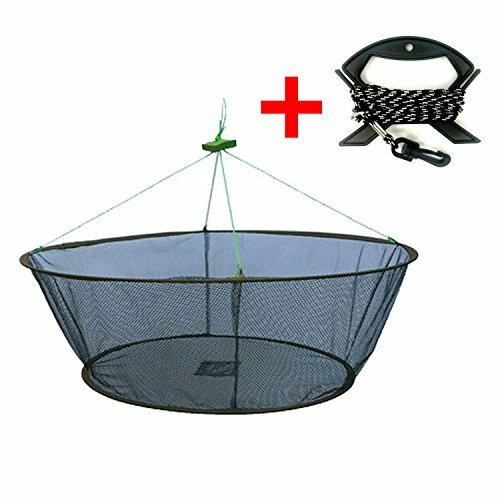 Easy Big Foldable Fishing Nets Hand Casting Cage is your perfect trap for catching fishes, crabs, minnows and more in the pond or river. The fish cast net comes in the form of a cage. Crafted from nylon and soft steel material, the net is robust enough to withstand the rigors everyday use. Plus, it’s water-resistant. What more, the cage is lightweight and highly portable. If the fishing pond or river is farther away, simply fold and carry it with you. Easy Big Foldable Fishing Nets Hand Casting Cage is pretty simple to use and requires no installation. All you need to do is pull the string at the top and it’ll open automatically. When expanded, the net measures 39 inches for the top diameter and 31 inches for the bottom diameter while the height is 13.7 inches. The diameter is 15 inches when folded. Using a cast net to catch fishes is not only fun but will also save you money you’d use to purchase baits from a store. And in choosing a cast net, you have to consider the weights, mesh size, net type and size of the net. We hope that our guide has helped you in finding an excellent cast net for your next fishing trip.